I combine the American and British lines to a wide genetic diversity and to get really strong nerves, healthy and balanced Collies. The American Collie is between 58 and 64cm tall and up to 34kg heavy. He has a slightly different face shape as the Briton, with slightly wider head and bigger eyes, the whole body is usually somewhat substance full of. One can distinguish the smooth topcoat and the undercoat clear also is the undercoat less plentiful and therefore tends not so much to mat. 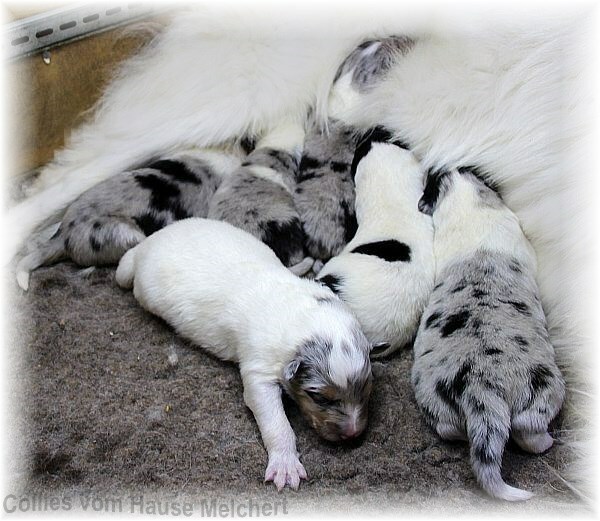 Furthermore allows the American standard more color varieties that are not allowed in the VDH standard, for example, the white Collie with colored head. 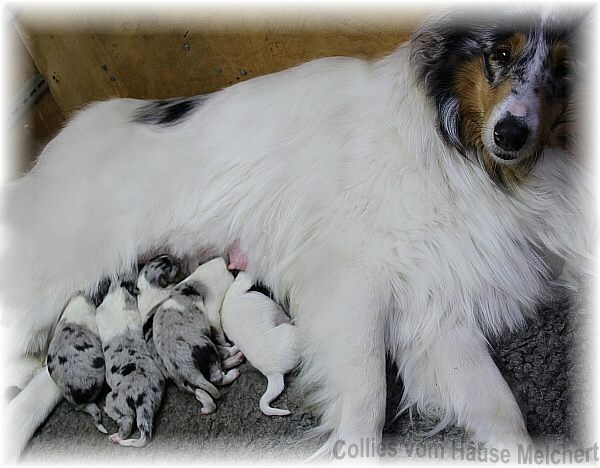 Through this careful breeding selection really very beautiful, absolutely healthy, and strong nerves typful Collie puppies are born, which are well marked with love and great circumspection. In my breed all puppies are free of eye diseases, hip dysplasia and the MDR1 defect. All puppies are chipped of course, vaccinated, dewormed, have studied animal medically, get the EU passport and a pedigree. My puppies have a large garden with playground and hiding places available. Also, house is an adventure for small Collies. 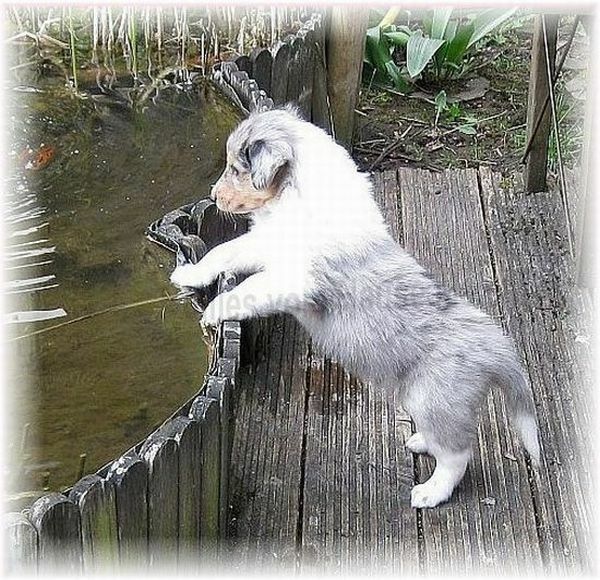 It is extremely important that the collie puppy will become familiar with as many different environmental influences. Much people visit, especially children, other animals, all kinds of equipment in the house, all there is to explore. American Collie puppies are very intelligent, open-minded and curious, want for this reason and they must know everything. Even without wanting equal buy a puppy, please feel free to answer any questions contact me. Also visits are always welcome at any time after the announcement. Our dogs live in packs with us in the house and on our large property. They live with us, not next to us! Kennel attitude we reject completely. 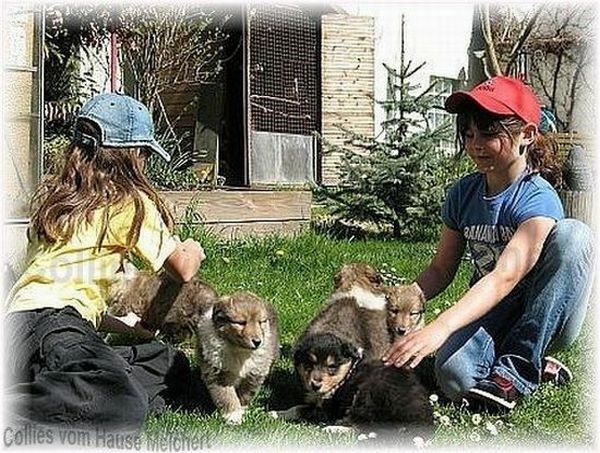 We also give our collie puppy continues only in responsible and loving hands. Family connection is an absolute requirement. Visits are always welcome. For all questions I am available at any time without obligation. 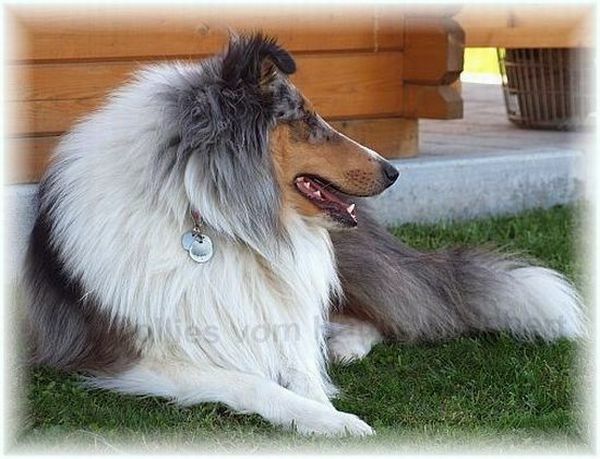 The American Collie type is about 58 (female) -64 (male) cm tall and weigh up to 38 kg. He has a slightly different face shape with more vigorous head and slightly larger eyes, the whole body is full of substance and bones stronger. One can distinguish the smooth long outer coat and soft undercoat clear also is the undercoat less plentiful and therefore tends not so much to mat. Furthermore allows the American Standard additional color varieties that are not allowed in the standard VDH. 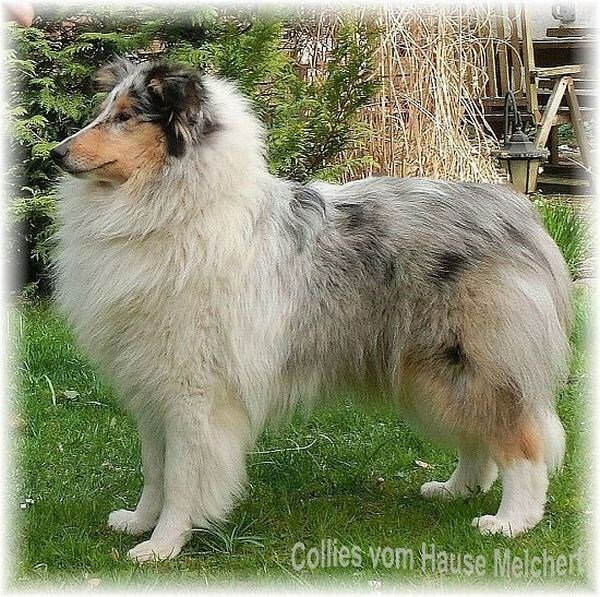 The white American Collie has predominantly white the typical drawn Collie head with sable, tricolor, blue-merle or sable-merle head and is only behind the frill. Spots are quite possible. Ideally, the amount of white is over 80%, but variations are the rule. 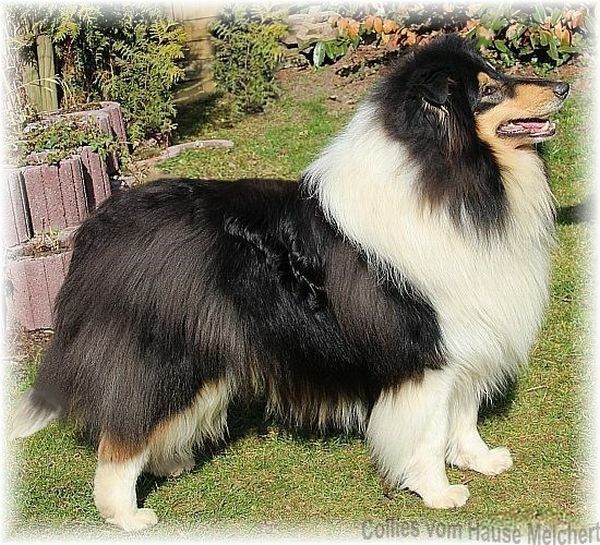 The Club for American Collies acquired the US breed standard, breeding in Germany Collies in the American type in five recognized colors, also in white and sable merle. If you are looking for a full-fledged, really absolutely healthy plus beautiful and incorruptible family member that goes with you through thick and thin, then you are right with us. Family Connection is a condition and essential.